South by Southwest can be a cacophony of sights, demos, and buzzwords. Not to mention music, booze and mayhem. In between all that there are insights. In digital health, I managed to find inspiration in many places. Here’s a few of them that I think imply trends with the potential for transformative impact on the healthcare industry. 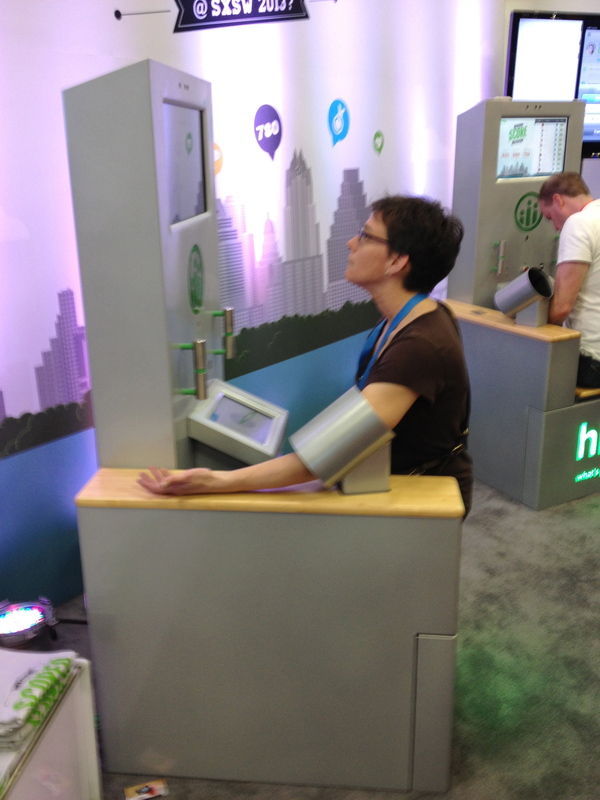 Higi – This new company offers a dramatic upgrade to the old blood pressure machines at the pharmacy. They are essentially putting attractive interactive kiosks into pharmacies and other settings to quantify and gamify health. I think it’s a slick way to get people engaged at the point of care/sale. Great consumer interface both physical and online with social competition and their own simplified scoring metrics. Me like. I’ll look for one of their units at a pharmacy near me. BlueGoji – Guitar Hero creator takes on health. While there isn’t much to talk about yet (stealth startup) I was sufficiently impressed by founder Kai Huang and how he built Guitar Hero into a global powerhouse in a crowded industry. He will likely take a lot of pages from that book to come up with game play that gets people healthier. Look for it as they get closer to launch later this year. BioDigital – Truth be known I met these guys before going to SXSW. But I did get a chance to see their new iOS based application that can serve up a digital human with as much detail as I’d ever want to see. Since it’s feeding off the cloud it has pretty amazing implications to visualize the body across a variety of medical contexts. You used to need a supercomputer to use this kind of thing 10 years ago, now it’s all rendered on an iPad. MayoClinic and Kaiser Innovation Groups – I didn’t know these teams existed, and I was very happy to know they do. Groups of smart, passionate intrapreneurial types, working on trials and research to help improve the quality of care. 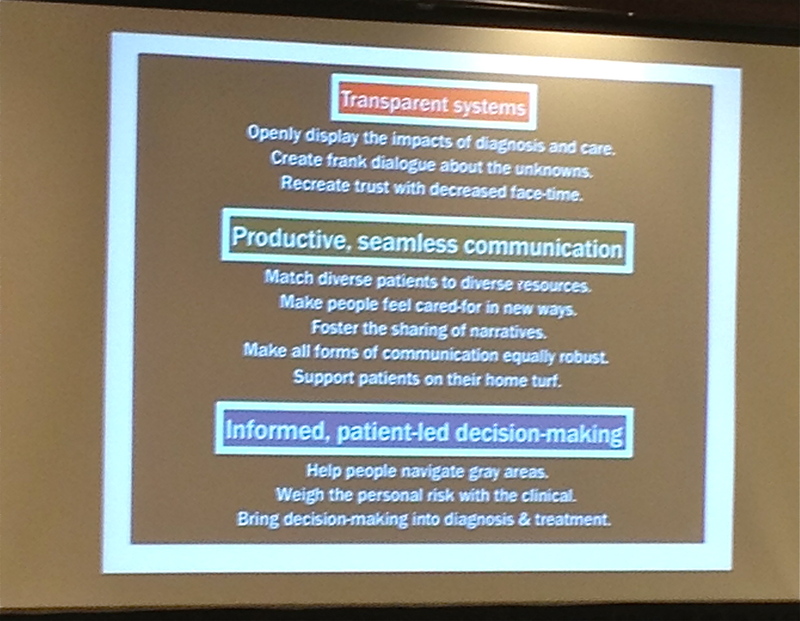 They gave a talk about the breakdowns and opportunities in a couple of care scenarios, and some of the takeaways are attached in the image below. Thanks to Meredith DeZutter at Mayo Clinic and Dana Ragouzeos from Kaiser Permanente for sharing. FourSquare – This might seem cliché but hear me out. Dennis Crowley founder of Foursquare made it crystal clear they are not about “badges” anymore. What they are is a massive curated database of location sensitive information. With their focus on exposing their API it gets interesting. How will health care providers mine this data to recommend healthier behaviors? Might a check-in unlock tips on the heart healthiest options at a restaurant or recommend the best 2.5 mile walking path in an unfamiliar city? How might other social data sources be used to support behavior shifts? It got my synapses firing. Funf.org – I ran into a very interesting group at the Knight Foundation booth. They have released open source code to support mobile sensing applications for Android currently. The technology came out of MIT lab, so it’s not dusty old code. This would serve to kickstart sensor based applications pretty quickly. With all the interest around quantified self services I love the idea that they are pushing this into the world as open source. Check it out at funf.org and maybe we’ll see more services emerge here in the coming year. RTM for Health – I spent some time listening to a great panel that focused on real-time marketing which included Gary Vaynerchuk (of VaynerMedia), Bonin Bough (from Mondelez), and a host of other smart people who are spending a lot of time with the analytics around social media. The buzz word of Real Time Marketing is usually used around brands who are hoping to harness the crowd sentiment (e.g. Oreo’s Superbowl tweet). But how might this be applied to healthcare service providers trying to connect with their audiences on a more real-time basis? One takeaway from Mr Bough was preparation is what will drive success. I’m hoping to see more examples of healthcare players taking advantage of the medium drafting off real-time events to connect with their audiences. Would love to hear more about all the stuff I missed in digital health while I was enjoying my share of the sunshine (and the booze).